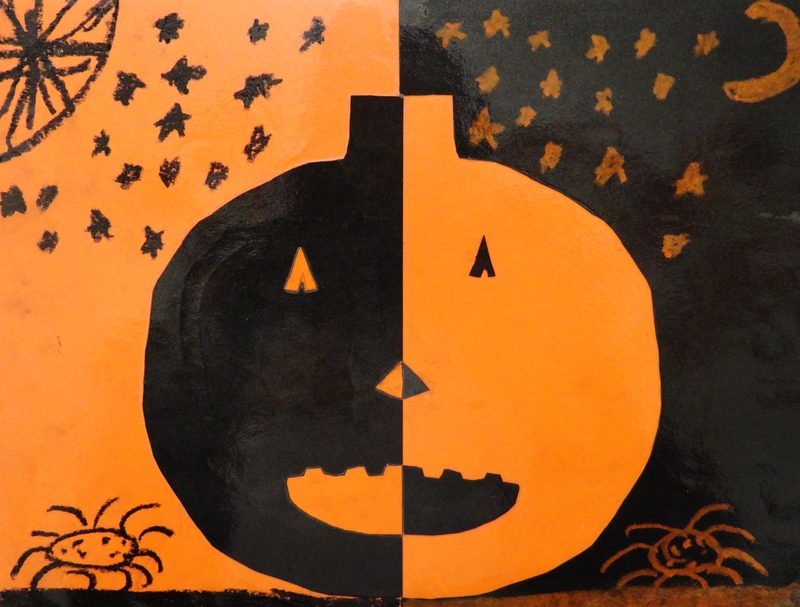 2nd Grade made fun jack-o-lanterns while learning about opposites, negative space, and positive space. Start with the black sheet of paper and place it vertically in front of you. Pick either the right or left side of the paper to work from. Now, put you left middle finger and pointer finger together and place it at the top of your paper on the side you choose. (I’m going to say the left side for myself.) Line the side of your middle finger with the top of the paper and make a mark below your pointer finger. Your mark should be about 1 – 1 1/2 inches away from the top of the paper. Place your pencil on the mark and draw half of a pumpkin. Start with the stem and try to take up as much space on the black paper as possible, so that the bottom of your pumpkin is close to the bottom of your sheet of paper. Cut out the pumpkin. There should only be two pieces of paper after doing this, the pumpkin and the scrap paper. Make sure you don’t throw away the scrap paper. Take the scrap black paper and place it on one half of the orange paper, making sure to line up two of your corners. Glue it down. On your half pumpkin cut out, draw an eye, nose, and mouth. Make sure you treat the flat side of your pumpkin as the middle of its face. So when you draw the mouth, the lines need to start on the flat side and end on the flat side. Cut out the eye, nose, and mouth. There should be no scrap paper. 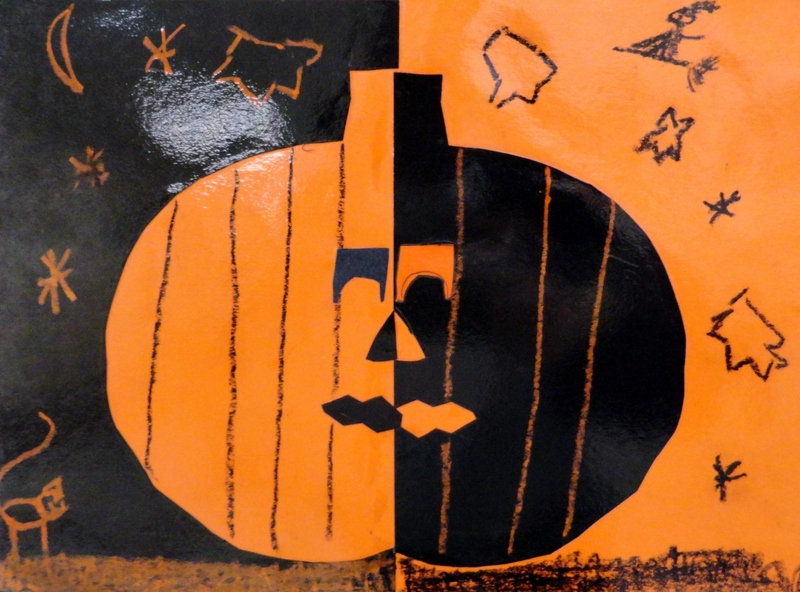 Next, I had students place their pumpkins back inside of the black scrap paper so it fit like a puzzle. Then I told them to flip over the pumpkin like you would a page in a book. Doing this should create a whole pumpkin shape when looking at the negative and positive space. Glue down. Take the face cut outs and glue them onto the orange half of the pumpkin, trying your best to make it identical to the black half of the pumpkin. Lastly, if students had time, I had them use black and orange oil pastels to add extra details. Reminding them to use the orange on the black paper and vise versa. I have to admit this was a little challenging for my 2nd graders. They seemed to enjoy it, but I really had to go through each step with them carefully. This would probably be much easier for 4th or even 5th graders. It’s a somewhat difficult project, but the outcome is always exciting!